Would God assign big kingdom work to a regular guy? God showed Phill Stumpf a revolutionary passion play would happen on the open streets of Elizabethtown, Pennsylvania, his hometown. Phill believed for ten long years until amateur actors from every church in town joined him to create this major production from scratch. But were they in over their heads? When they faced serious illness, legal issues, and the rejection of their performance permit for the date already advertised, they began to question. Were they caught up in God's grand plans, or just mistaken? Nothing builds faith like real-life stories. 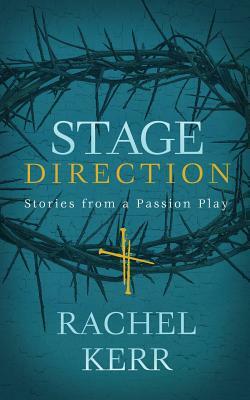 Stage Direction will encourage you: God has been leading his people since before the cross...and the drama isn't done unfolding. Rachel Kerr has a degree in English and Biblical Studies from Toccoa Falls College. She is an active member and women's ministry planner at Wheatland PCA in Lancaster, Pennsylvania. She's also a wife and mother of two, and a lover of creative nonfiction. You can follow her blog at rachelkerr.wordpress.com.